Entrada Textured Rag Paper is a 100% cotton, 300 gsm (22.5 mil), archival fine art paper. Acid-free and lignin-free with an expanded color gamut, it provides natural contrast and accepts a high ink load. Compatible with dye and pigment inks, it has a wide tonal range and high dMax. ™ Legion Papers is a trademark.™ Moab is a trademark. 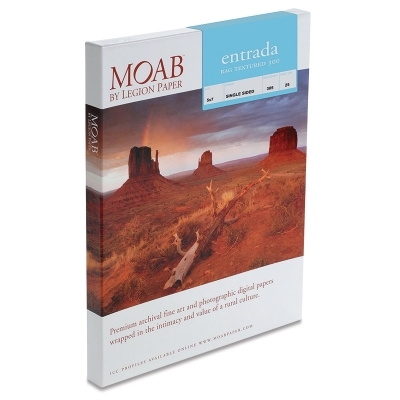 ® Entrada is a registered trademark.